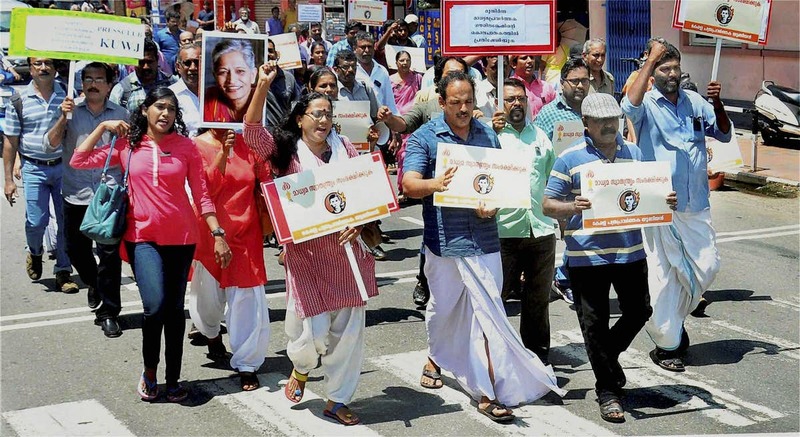 From Gauri Lankesh's murder to defamation suits, attacks on the media have become commonplace. New Delhi: The ‘India Freedom Report: Media Freedom and Freedom of Expression in 2017’ by The Hoot confirms with data what an alarming year 2017 was for journalists, including photographers and stringers, reporting from different parts of the country. Last year saw 11 journalists murdered, the reason for three of which can be connected to their work, 46 cases of attacks and 27 cases of police action including arrest and cases filed. In September, Gauri Lankesh, editor of the weekly Lankesh Patrike – a magazine that has been described as an “anti-establishment” publication – was shot dead at her residence in Bengaluru. Two journalists were killed in Tripura – Santanu Bhowmick from the news channel Din Raat while he was covering clashes between two rival tribal associations, and Sudip Datta Bhaumik, a senior journalist with Syandan Patrika, who was shot dead by a Tripura State Rifles trooper during an altercation in Bodhjung Nagar in Tripura. Journalists faced the most number of attacks from the police and from politicians, as the table below shows. These include the journalists injured during the violence following the arrest of Dera Sacha Sauda chief Gurmeet Singh in August 2017. Television vans were set on fire and reporters and camera persons were injured in the clashes. In 2017, the report says, Maharashtra had the highest incidence of defamation with 19 cases. Five of these were filed by film and TV personalities and one by former Central Board of Film Certification (CBFC) chief Pahlaj Nihalani. The Adani group filed a defamation case against Sameeksha Trust that publishes the journal Economic and Political Weekly, its editor and other journalists. The Mumbai police filed two cases – one against a journalist who allegedly showed them in poor light, and another against an ethical hacker who had, in 2016, claimed that senior Bharatiya Janata Party (BJP) leader Eknath Khadse was in touch with Dawood Ibrahim. Andhra Pradesh saw the largest number of attacks on and threats to journalists. In December 2017, the police in Hyderabad arrested a member of a Christian evangelical organisation for allegedly giving a speech against ‘bharat mata’ in August 2016. The highest number of state actions for internet and social media-related incidents was recorded in Karnataka. In Tamil Nadu, the number of defamation cases have gone down sharply following Jayalalithaa’s death in December 2016. It recorded a low of seven cases, with the AIADMK filing just one, and not against a journalist. This sets a new record for the party that had filed an estimated 200 defamation cases against journalists, social activists and opposition leaders between 2011 and 2016. The largest category of complainants were politicians (25), followed by corporate houses (11) and film and TV personalities (nine). A further breakup of the politicians shows that of the 25 who filed complaints, 13 belong to the BJP. A number of state governments restricted media access to various events, the list includes the governments of Goa, Jammu and Kashmir, Kerala, Odisha, Rajasthan and West Bengal. The BJP-led government in Goa was accused of restricting media access to the secretariat and holding selective media briefings on orders from chief minister Manohar Parrikar. In June, electronic media in West Bengal’s Darjeeling were asked to stop airing Gorkhaland protests. The same month, Naveen Patnaik’s BJD-led Odisha government asked officials not to respond to the media without prior permission from the state’s government. After weeks of political violence between the CPI(M) and the BJP in Kerala, when the leaders of the two parties gathered at a hotel to broker a truce in August last year, Kerala chief minister Pinarayi Vijayan chose to bar the media from reporting the event and had them removed from the room. In October, the Vasundhara Raje-led BJP government in Rajasthan brought an ordinance – the Criminal Laws (Rajasthan Amendment) Bill – that amends the Criminal Code of Procedure (CrPC), 1973, and enhances levels of immunity to public servants. According to the new rules, no investigation could be ordered by the police under Section 156 or a magistrate under Section 190 into allegations against public servants, judges and magistrates. Journalists are barred from reporting these allegations, unless and until the state government sanctions the prosecution. It was withdrawn following widespread outcry. In December, reporters in Jammu and Kashmir were not allowed to cover the activities of the government of India’s interlocutor Dineshwar Sharma’s maiden visit to Kupwara district in the state. Apart from censorship, the report also has a category called self-censorship, and 2017 had numerous examples of such cases as well. Some instances are the Sahara-Birla papers, which most media houses did not cover, “perhaps because of the defamatory implications of reporting on this,” the report says. India fell three places in the international press freedom rankings in April last year. 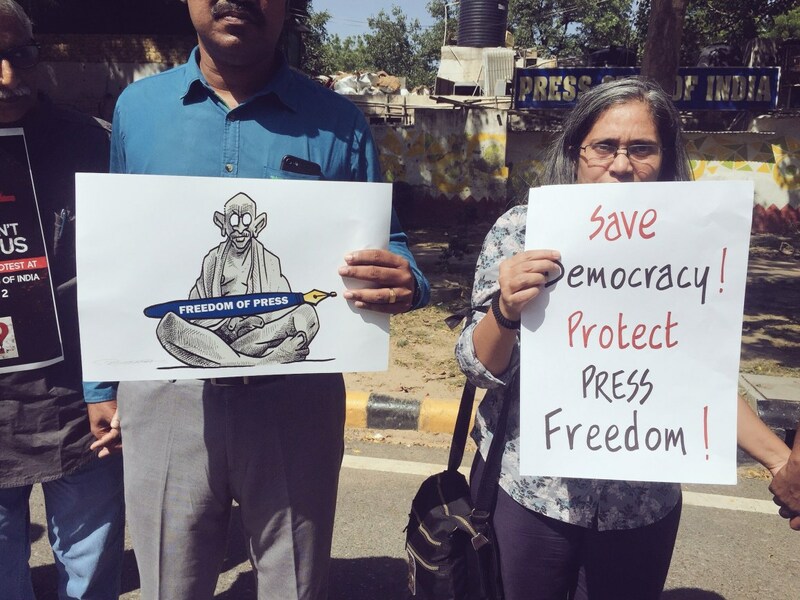 The ranking, based on an index of press freedom report by the global media watchdog Reporters Without Borders, said journalists were less free under the Narendra Modi government. The Economic Times had carried the story but it was later taken down. The Times of India took down the story as well. Paranjoy Guha Thakurta quit his post as the editor of EPW when the Sameeksha Trust that publishes the journal asked that the article he had co-authored on the Adani Group be taken down. In September, Bobby Ghosh, the editor of the Hindustan Times resigned. While the paper said this was due to “personal reasons” The Wire had reported that Ghosh’s resignation had in fact been preceded by a meeting between Modi and HT proprietor Shobhana Bhartia and objections raised by BJP officials to editorial decisions taken while Ghosh was editor. In October, The Wire’s story on BJP president Amit Shah’s son Jay Shah’s company was self-censored by other media houses. NDTV’s Sreenivasan Jain’s report on loans given to Jay Shah’s company was removed from the website. Jain wrote in a Facebook post that this was for “legal vetting” but the article was not restored. Towards the end of 2017, Caravan magazine published a story about the mysterious circumstances surrounding the death of CBI judge B.H. Loya who was handling the Sohrabuddin fake encounter case. This story too was not picked up by most media houses. In total, 16 instances of hate speech were recorded, and ten of these were against politicians or members belonging to the BJP, or against right wing groups like the All India Hindu Sangathi Manch and the Hindu Jagarana Vedike. 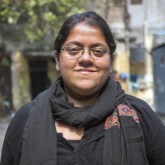 On June 9, Malik Abdul Basit of the Caravan magazine was forced to shout “Pakistan murdabad, Hindustan zindabad” and was accused of being from Pakistan when he was reporting the razing of a mosque in Delhi. Basit is a Kashmiri Muslim. On August 11, the government of Uttar Pradesh directed all madrassas in the state to celebrate Independence Day and video record the event. The year also saw a huge rise in the number of internet shutdowns imposed in various states – 77 against 31 the previous year. A shutdown was imposed in every month last year, in at least one part of the country. The highest number of cases was in Jammu and Kashmir (40) following by Rajasthan (11), Haryana (eight), Bihar (three), Uttar Pradesh, Tripura, West Bengal, Nagaland and Odisha (two each), and Telangana, Gujarat, Madhya Pradesh, Maharashtra, Punjab and Chandigarh (one each).